Compared to other national parks and forests, the White Mountain National Forest (WMNF) is small. Smaller still are the Wilderness areas within its confines. They’re there, though. Six of them! And they are likewise small. Of the 107 million acres of designated Wilderness across the country — the bulk of which are, logically, located in untamed Alaska — only about 153,052 acres are located within the WMNF. We’re not complaining, though. By New England standards, that’s a big chunk of land and we’re happy to have it. Fuggedaboudit. Seriously don’t even think for a minute. In the WMNF these areas are identified on the area hiking maps as shaded areas. On trail, visitors are greeted with a sign on most trails at the first point of entry. Upon entry, other changes occur (some will be more noticeable than others). For example, a regular WMNF hiking trail corridor is, by design albeit not in reality, 4-feet by 8-feet with a 24″ treadway. In the Wilderness areas, this designed corridor shrinks to 3×6-feet with an 18″ treadway. Another change is that sign mileages are no longer available (use your map) and that blazes are no longer seen — excepting newer areas. The idea is to allow for a more natural, less impacted feel. You’ll also find that common trail structures like bridges exist only to facilitate safety and appear with less regularity. Additional changes are regulatory and pertain to use such as backcountry camping, hunting, fishing, use of equipment, logging, mining, etc. Size: 14,000 acres. Designated: 1990 Maine Wilderness Act. Feel: Being that this Wilderness is located wholly in Maine makes it “out there” in terms of WMNF Regions in the eyes of many. This is reflected in the condition of the trails. 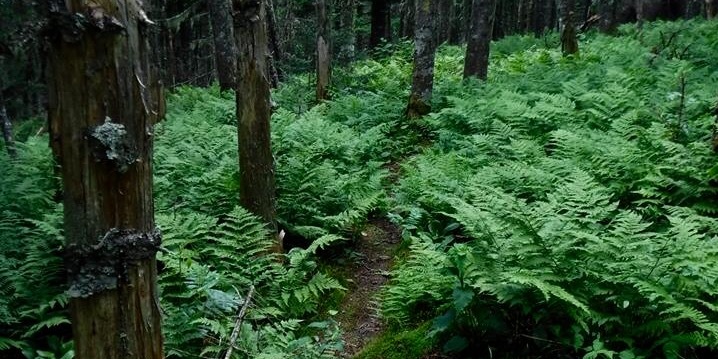 Even on trails to the more popular peaks like Caribou and Speckled Mountain, you’ll find less erosion and a more duff-littered [read: soft] treadway. It’s an easy wilderness to find yourself alone in. Getting lost might be less of a problem, though, since some blazing still exists from the ’90s. The blazes are so old, though, as are the bog bridges, signage, and other relics, that the feeling of Wilderness remains intact. 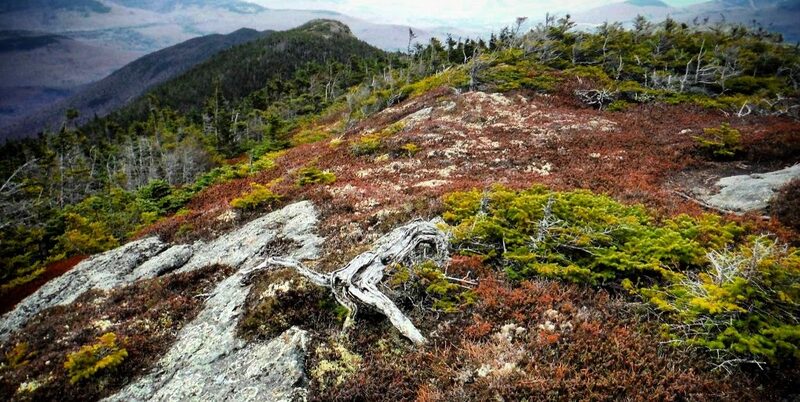 The Caribou-Speckled Mountain Wilderness… with nobody around! Typical. Size: 5,552 acres. Designated: 1964 Wilderness Act. Feel: Three adjectives come to mind when the topic of the Great Gulf comes up. The first is Wild. The West Branch of the Peabody River always seems to rage through (it’s actually bridged by a very bouncy footbridge) lends a sort of rugged uncontrollability to this area. Adding to the wild feeling is that it always seems Dark in the heart of the Great Gulf (once called the Gulf of Mexico). It’s been a while since it’s been logged and is teeming with tall, dense trees. One could say it’s downright prehistoric, but then some summer afternoon you hear it: the Noisy traffic from the Auto Road. 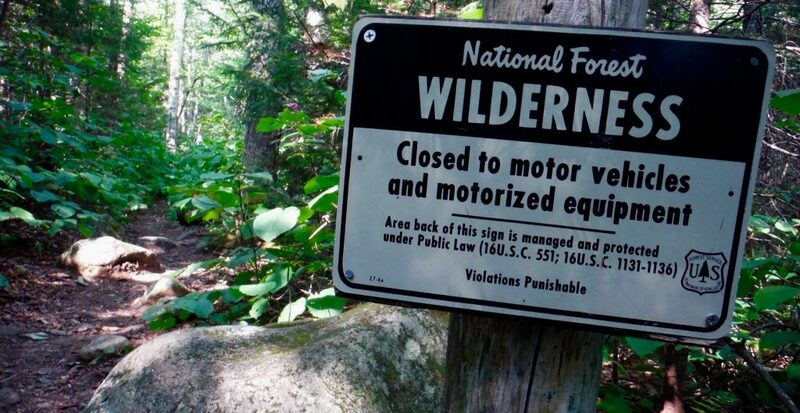 It seems like such a shame, but one needs to realize the Auto Road existed long before the Wilderness was designated and that it’s now part of the area’s history. Clam Rock. One of a handful of Wilderness tentsites. Wild. Dark. Noisy (at times). Somewhere deep in the Pemi. Size: 29,000 acres. Designated: 1975 Eastern Wilderness Act, then expanded in the 1984 by the New Hampshire Wilderness Act. Feel: Personally speaking, aside from hiking to Mt Isolation and traversing the Montalban Ridge, the author explored the trails in the heart of this particular area right after it re-opened. This was after being closed for years due to massive damage caused by Hurricane Irene. The feeling of exploration was strong. The first journey, a multiday trip, started in heavy rains making it a dark, lonely, even foreboding place (note to the unwary: the river is anything but dry). A subsequent visit in sunshine was anything but dark and foreboding, but the loneliness remained, as did the feeling of exploration. Redline Guide Bill Robichaud approaching Oakes Gulf. Size: 35,000 acres. Designated: 1984 New Hampshire Wilderness Act and further by the 2006 New England Wilderness Act. 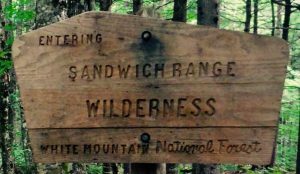 Feel: The Sandwich Range Wilderness is the one most people drive by on their way to the mountains, ignoring it for such destinations as Franconia Notch in the west or the Mt Washington Valley in the east. Their loss. Many will agree that this vast east-west strip of wild is largely ignored by many except where the trails to its 4000-footers or 52-With-A-View peaks penetrate. This range seems underdeveloped in some ways when compared to the other regions, and that’s because it is. It is perhaps the least accommodating to folks seeking accommodations. Size: 23,700 acres. Designated: 2006 New England Wilderness Act. Feel: Like Maine, to put it in simple terms. Otherwise, think of a cross between the Sandwich Range, the Pemi, and the Caribou-Speckled Mountain Wilderness areas for a sense of the Wild River. The name of the area itself and that of its namesake river really help define this acreage. And the river is indeed wild. Thanks to a lack of bridges, acts as a moat of sorts barring thoughts of easy entry. This helps keep the Wild River area wild. Moreover, all the really popular destinations are accessed from north and south. Thus, it’s easy to expect lonely hikes here. The White Mountain National Forest is an amazing place, full of wonder. And for many, discovery. There was a day when these forests were logged to capacity, and signs of this activity remain even to this day if one knows where to look, but with the help of citizens and concerned people in government, these six areas in the core of this National Forest remain as a very special resource. To learn more, there are links to additional resources that can be found in this article. We’re referring to the alpine zone. It’s not actually a federally designated Wilderness area, but the alpine zone is a rare and special place worthy of protection. There are all told just over 13 square miles of this environment east of the Mississppi River, with the biggest single section being a mere 8.3 square miles atop the Presidential Range. The rest can be found on Franconia Ridge in New Hampshire, in Baxter State Park in Maine, on Mt Mansfield in Vermont, with the remaining bits scattered here and there in those same three states. Needless to say, this type of area really needs to be protected and preserved no differently than our Wilderness areas. 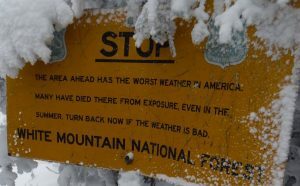 Fortunately there are organizations devoted to this local cause of alpine preservation such as Protect Mount Washington and others. The alpine tundra. A special place to be respected and protected. 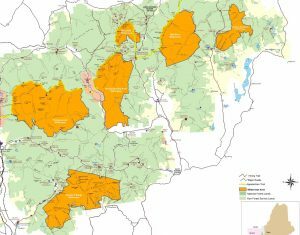 When talking about Wilderness areas in the WMNF, after the six Uncle Sam designated — plus one with our nod to the alpine zone — it’d be a shame to miss out on mentioning the Mahoosuc Range and the Kilkenny Forest (Pilot and Pliny Ranges). Neither of these areas are designated Wilderness areas, but those who know, know, it doesn’t get much wilder in the state of New Hampshire. Especially the Kilkenny for a straight-up Wilderness-esque experience without setting foot on recognized acreage. Here are a couple of photos to whet your appetite. The forbidden Kilkenny Forest, a Jurassic Park of ferns. A tad “moosey,” they say. Wright Trail, just one gem in the rough on the Mahoosuc Range. Stunning. There are other undesignated wild places in the region, certainly much of the state of Maine has that wilderness feel, and within New Hampshire itself, especially up north, you can find plenty of wild spaces, albeit smaller and more fragmented: Nash Stream, Umbagog, Pittsburg, to name three. Want to explore these wild places? We’ll show you around if you like.